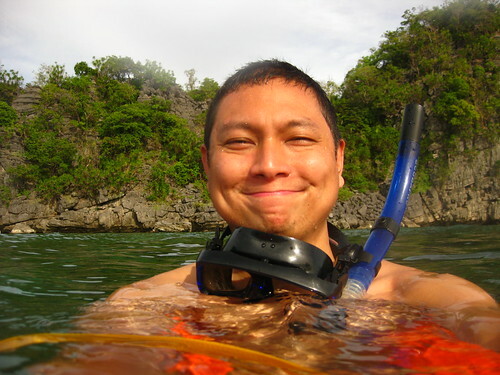 We were in the Philippines for about a week and a half — in Metro Manila for Christmas, then in Coron, Busuanga after Christmas through New Year, and back in Metro Manila for a few more days onward. 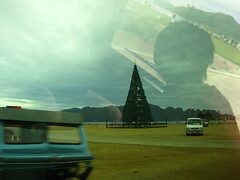 12/23/2011: Day 1. Banking chores, then Teriyaki Boy for lunch, and Watson’s for basic supplies. 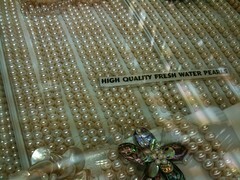 Amy is on a strict “cooked, bottled, and canned” rule, so we’ll need a few liters of distilled water. Around Greenhills I note with some amusement that there are far fewer of the notorious “DVD boys,” replaced instead by “download boys” calling to shoppers from storefronts. 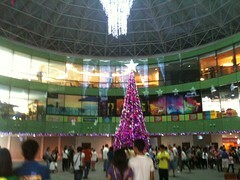 In a way Virra Mall (I refuse to call it “V-Mall”) seems to be returning to its floppy-copying roots. We’re staying in my brother Javi’s room while he’s away in France, so we get to actually live at home with my family this Christmas rather than in a hotel, which is nice. 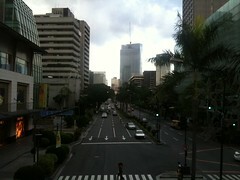 We spend the afternoon completely knocked out from jet lag. 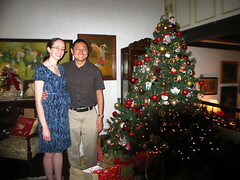 12/24/2011: Christmas Eve. 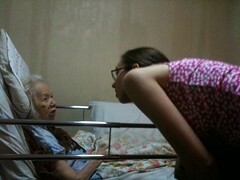 In the morning we join Mom at a deli to get some salmon, and visit my aging grandmother, who is mostly bedridden at home. Another jet-lag-driven afternoon of sleep, but late in the evening the family heads to Dasmariñas for our time-honored Christmas Eve tradition: midnight mass and Noche Buena with the Bautistas, massive clan of my father’s sister, spanning the offspring of eight children, countless dozens of grandchildren and a growing fourth generation of great-grandchildren. 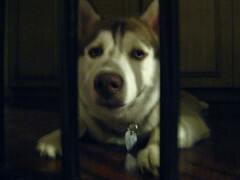 And some cute puppies. 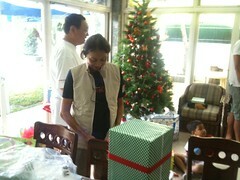 12/25/2011: Christmas morning. 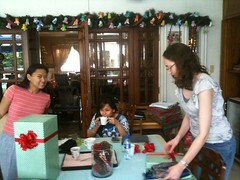 I receive a scuba mask, cardigan, Yoda magnetic board, and Three Tenors Christmas CD. To my Dad I have gifted a Lifeproof case for his new iPhone 4S, to Mom a Scottevest, and to my brothers coffee cup car power adapters. In the afternoon we take advantage of the malls being open to check out Muji in Greenbelt and drop by Landmark for some cheap clothes. Muji is a bit too pricy but at Landmark I purchase large quantities of underwear, socks, and handkerchiefs. 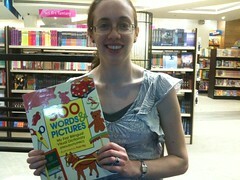 At PowerBooks, Amy gets some Tagalog vocabulary enrichment literature. I note with amusement that “Dianetics” has been miscategorized. 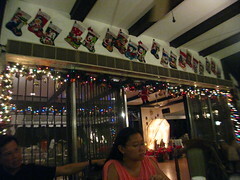 As with every year relatives come visit us for Christmas dinner at home. 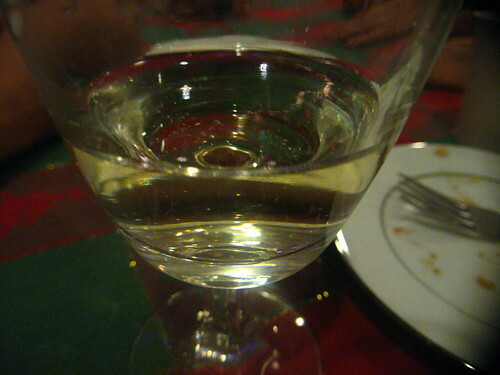 There is prosecco. 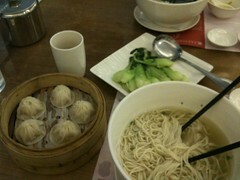 12/26/2011: Crystal Jade La Mian Xiao Long Bao soup dumplings for lunch. They’re amazing. 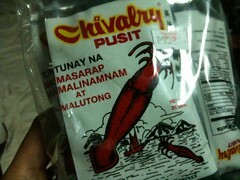 Later at the Chinese snack shop I find a bag of Chivalry Pusit. 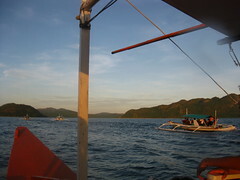 12/27/2011: Fly out of MNL Terminal 3 on an AirPhilExpress Dash-8 to Busuanga with the family for a holiday in Coron, an up and coming seaside resort town on the south side of the island. 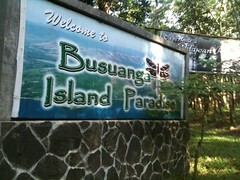 For the next three days we will stay with the Bautistas at Sunz, an inland resort on the outskirts of town. 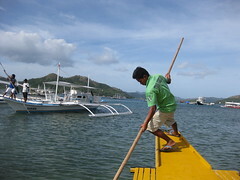 My cousin Criselle has assembled a family-friendly itinerary of sightseeing and island hopping with Coron Ecotours. For our first day there we see a souvenir shop. 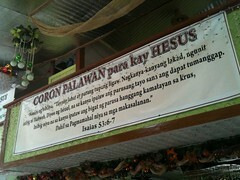 Above the shop is the meeting space for an evangelical church group, billboard with biblical quote from Isaiah (in Tagalog) over the store entrance. 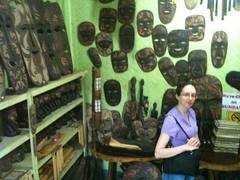 Lining the walls beneath the banner: carved wooden masks, a common Coron motif. Next stop is Lualhati Park, a mostly-paved public waterfront space beside the local port, sitting atop a reclaimed peninsula, flat and empty but rich with the promise of further development. 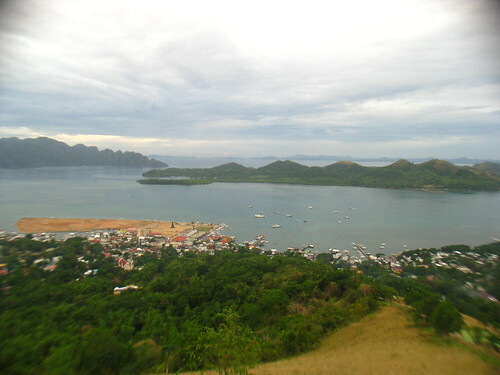 “Lualhati” translates as “glory.” Across the channel Coron Island (separate from the town, despite having the same name) looms craggily. 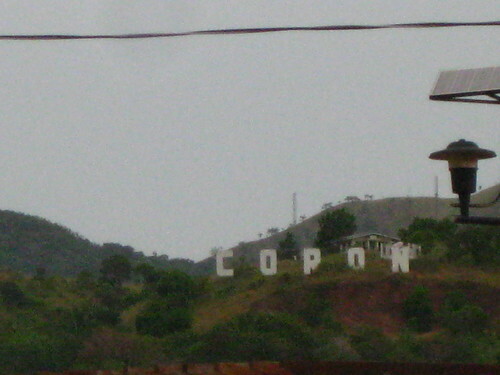 Further inland a hill displays a Hollywood-style sign with the town’s name, and a cross sits atop a taller hill, Mount Tapyas, where we go next. A 750-step stairway climbs the slope of Mount Tapyas from the peak of which you can stand at the foot of the giant cross and view the town and the hilly landscape it nestles in. It’s a moderately tough climb as I am out of shape, but the view is worth it. Last stop of the day is well outside town, down a dirt road to Maquinit Hot Springs. Here a natural geothermal spring pours down the slopes to feed an artificial pool where visitors can bathe in steaming hot, slightly salty water. It’s a nice way to end the day — would be nicer if there were more than one dressing room per gender, preferably not covered in mud and infested with mosquitoes. This is the Philippines. 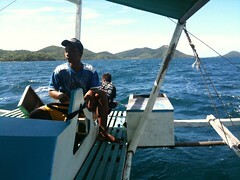 12/28/2011: Island-hopping on the itinerary today. 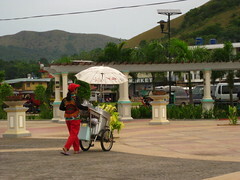 The clan crams into multiple tricycles down to the port, and then into multiple bancas to cross the channel to Coron Island, ancestral domain of the Tagbanua people. 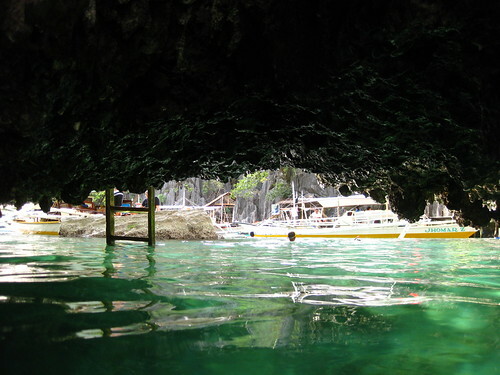 A steep, rocky climb up and down a ridge leads to Kayangan Lake, a clear, brackish lake populated with tiny needlefish, and surrounded by towering cliffs. 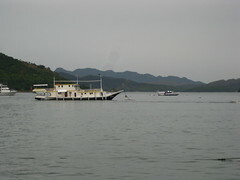 A too-narrow pier at the end of the trail serves large numbers of swimmers. 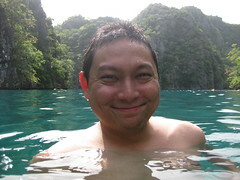 After a few minutes in the lake, another climb out of the island, then to a coral garden for snorkeling, and a beach on Coron Island for lunch. There is a rooster here, and a snake. 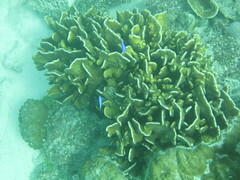 After more snorkeling, an interesting late highlight in the day is Twin Lagoons, where one lagoon’s only outlet to the sea is a low tidal tunnel, big enough to swim through. 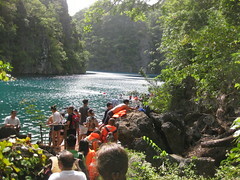 On the other side, the inside lagoon sits nestled amidst craggy volcanic cliffs. 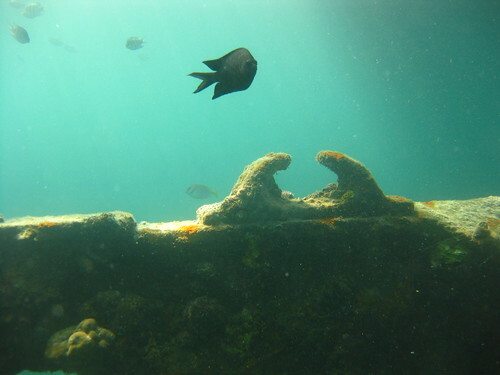 At high tide, the tunnel disappears underwater. My camera battery runs out at this point. 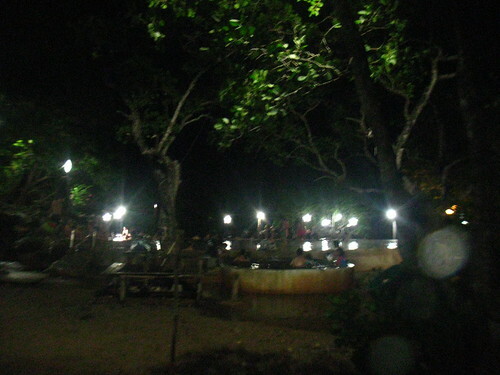 By the time we return to Coron, night has fallen. 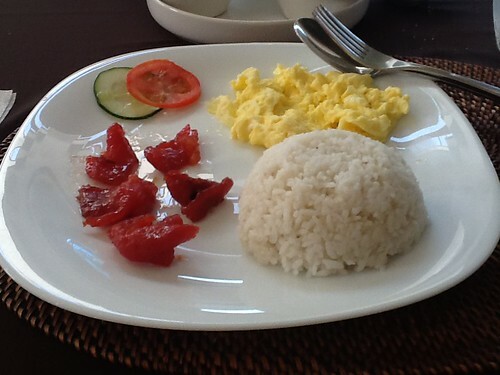 12/29/2011: Breakfast consists of five pieces of tocino, a scrambled egg, and a cup of rice. 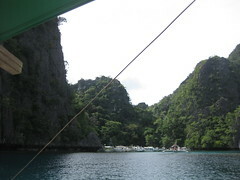 Then, more island hopping. 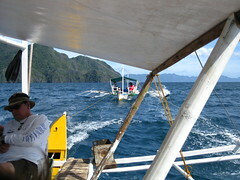 The first stop of the day is Calambuyan Island, about an hour and a half out from Coron by banca — a trip made far longer by our boat’s rudder breaking in rough seas near Lusong Island, necessitating a lengthy wait for pickup by a backup banca in the lee of a cove. 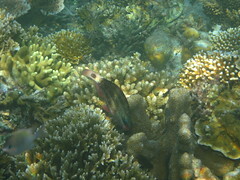 On arrival at Calambuyan there is just enough time for lunch and a quick snorkel in a swift current before the next stop, another coral garden near a pearl farm. 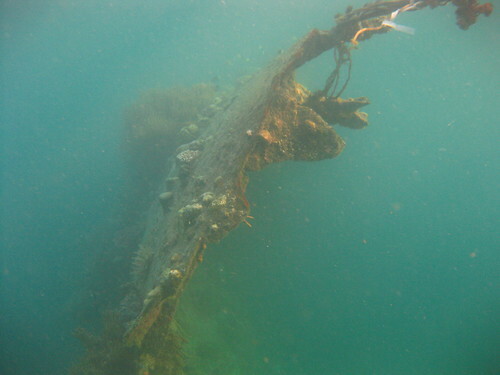 Last stop of the day is back at Lusong, at the shipwreck of a small Japanese WW2 gunboat, sunk in waters shallow enough to snorkel. With a number of small, lightly stinging jellyfish in the water, Amy opts not to go in, but I go under for a few minutes just to get video — and seven mild jelly stings. 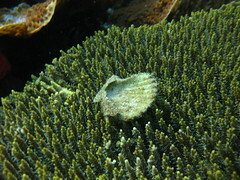 Mosquitoes of the sea. 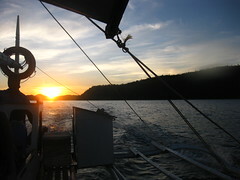 Lovely sunset on return to Coron. 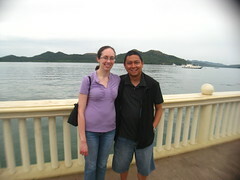 That night we transfer to Busuanga Island Paradise resort to stay till New Year, while the Bautistas return the next day. 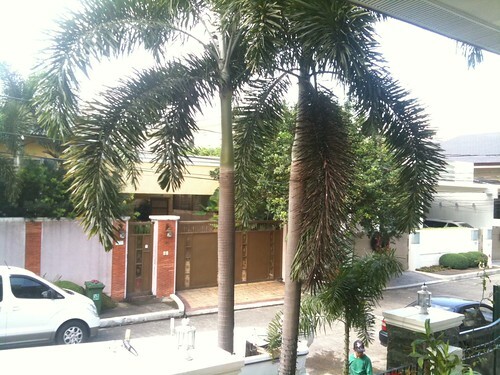 BIP is farther inland but has larger grounds and rooms in a natural rainforest setting — and faster wifi. With the exception of a thick cloud of bees hovering outside our rooms the first night, the resort is quite lovely. 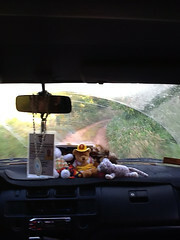 Staff tells us there is an apiary on the grounds producing local honey. I feel like the hives might be right in the rafters, but mostly the bees are no bother. 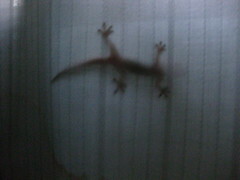 Anyway, the geckos do a pretty good job of controlling the insect population. 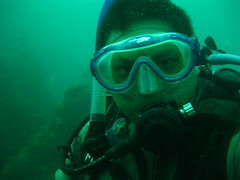 12/30/2011: Family scuba day! 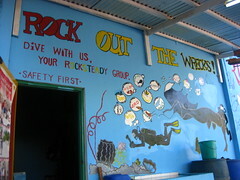 We take a shuttle to Rocksteady Dive Center to meet with our divemaster, nicknamed “Wizard,” then ride the flatbed of a cargo tricycle down to our banca for two wreck dives: East Tangat Gunboat and Morazan. 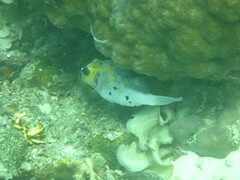 See the upcoming dive log entry for details. 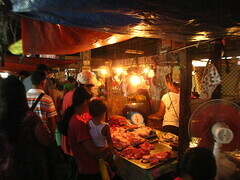 On the way home we drop by Coron Public Market, where Mom buys some lato (an edible seaweed). It’s quite a market. 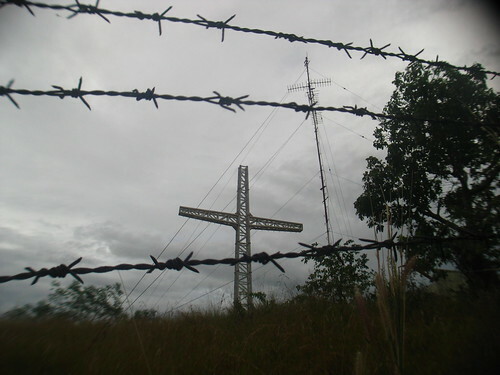 12/31/2011: Calauit Island: north of Busuanga, former Tagbanua ancestral domain, forcibly turned by the Marcos regime into exotic wildlife refuge, now in a state of gradual decline. 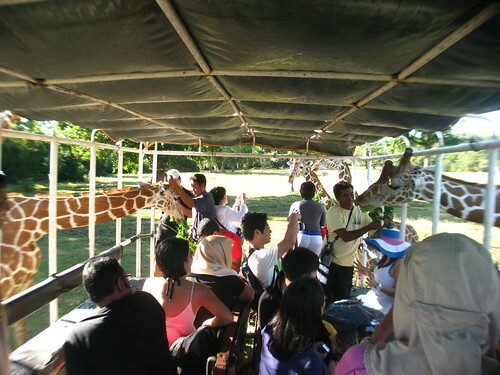 It’s a sad state of affairs but you can still go visit to feed giraffes, pose with zebras, and view assorted other animals of various local and international origins. After leaving at 4:30AM, it’s a grueling two hour drive over rough, unpaved roads of dirt and rock to get to Calauit, plus a four minute banca ride. 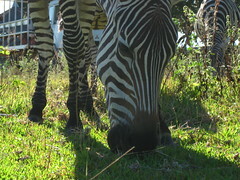 From the landing we are served packed breakfasts in the barebones visitor center, then board a cagelike safari truck, on which we spend the day traversing the grounds. 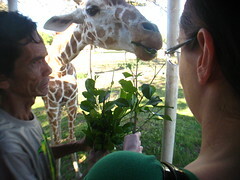 Highlight of the morning is definitely the giraffe-feeding. 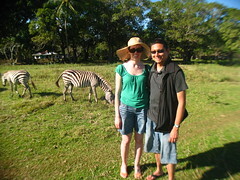 We also get to pose near some zebras. 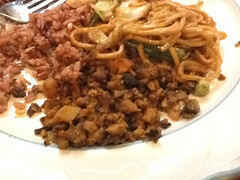 Afternoon lunch at Bistro Coron in town, prepared by a foreign chef who now lives here. 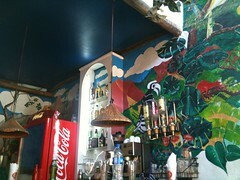 The food is excellent. 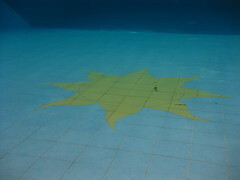 Then, a swim in the pool. 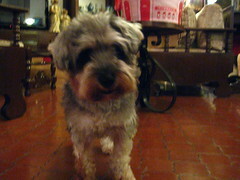 We are so tired from today that we sleep through midnight of New Year 2012. 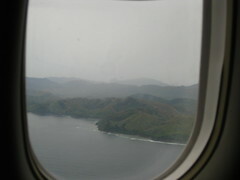 1/1/2012: Flight back to Manila at noon delayed due to low visibility from heavy New Year fireworks haze. 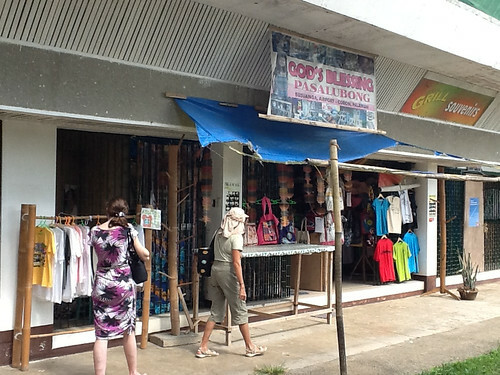 We drop by the neighboring shop (“God’s Blessing” Pasalubong, more evidence of missionary zeal) to pick up some souvenirs and a nice mesh bifurcated snorkeling gear bag. Flight back is indeed fairly hazy on approach to MNL. After landing, lunch at Shakey’s, then home to rest. 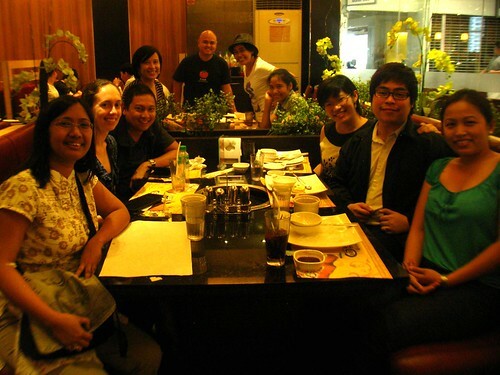 1/2/2012: Meetup with old college friends at Podium, upscale mall in Ortigas beside Megamall. 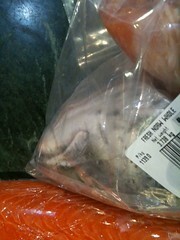 We have lunch at Yakimix, an Asian buffet with sushi and a smokeless table grill. It’s great to see everyone again. 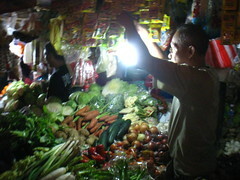 Later that night I try some meatless bopis from a vegetarian food stall in Greenhills. It’s an excellent mushroom-and-TVP approximation of minced pork lung — but has been sitting on a counter in a street-market-style food court all day. The resulting stomach flu has me resolving never to go there again. 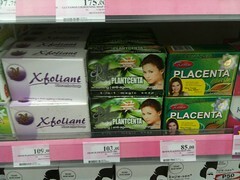 On an unrelated note they have placenta soap in the drugstore. 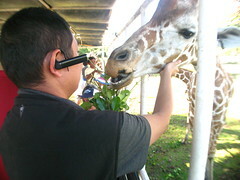 1/3/2012: Day at Manila Ocean Park, a new marine attraction behind Quirino Grandstand that I’ve been curious to check out. First, lunch at Pancake House. Amy has pancakes but my stomach is still in tender enough condition that I just have a cup of asparagus soup. 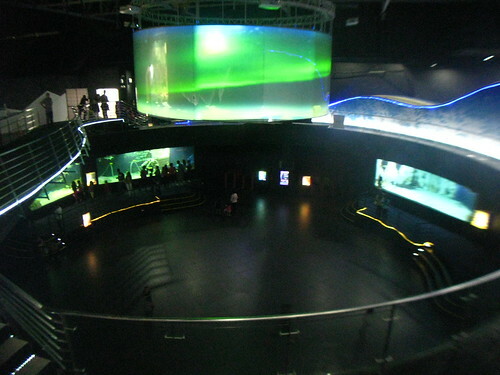 The main “Oceaniarium” consists of assorted tropical aquariums and habitats leading to a central plaza with large tanks for larger fish, and a tunnel through a grand tank of decent size with fish, rays, and even a sawtooth shark. 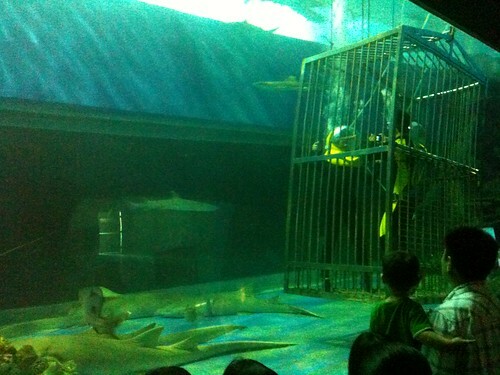 A large shark tank follows, full of reef sharks and leopard sharks, at the center of which hangs a cage, where a visitor in an Aquanaut helmet apprehensively snaps photos with her waterproof camera. Upstairs, we also check out the penguin exhibit, which proves somewhat disappointing. The habitat is depressingly small, and the space seems inadequate for the number of penguins visible. The attraction includes a slide, on which visitors ride tubes down an ice ramp; and a “Snow Village,” which we skip altogether, having already come from a place that gets snowy winters. 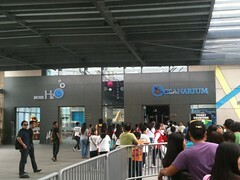 By the way, I’m happy to report that the restrooms at Manila Ocean Park are usable. 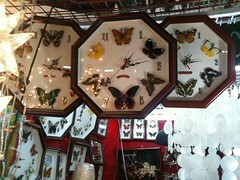 1/4/2012: Last day in Manila, afternoon leisurely spent in Greenhills browsing tiangge for post-Christmas sales on clothes, crafts, clocks, pearls, and corn nuts. 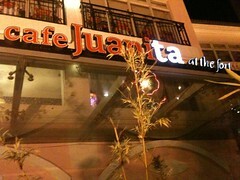 In the evening, a family dinner at Cafe Juanita in Fort Bonifacio. Amy discovers she likes pochero. 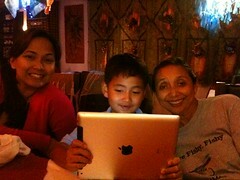 I capture a classic iPad moment with Steph, Uno, and Mom. 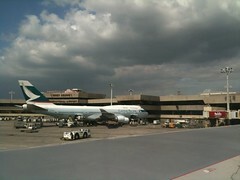 1/5/2012: Fly out to Hong Kong. 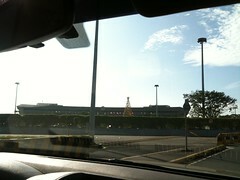 NAIA horrible as always. 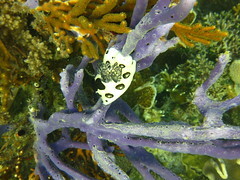 But a good visit to Philippines, happy to have spent quality time diving wrecks and feeding giraffes with family. 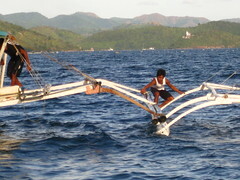 Full Philippines photoset here.